Save that packaging if you do! Cool stuff. I HAVE USED SOME VERY OLD PRIMERS WITHOUT ANY problems. I HAVE MORE PROBLEMS WITH CHEAP ONES THAN OLD ones. 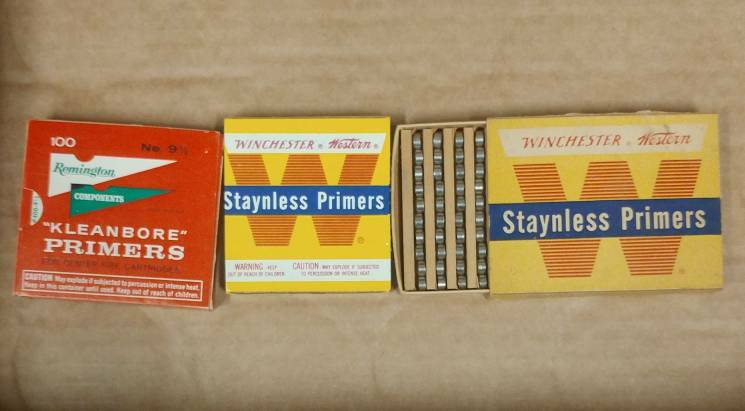 I bought some Winchester small rifle primers in the wooden tray in the 1970s. Was told folks used them to substitute for small pistol primers in WWII. I have used most of them and have yet to have any not fire. Was told on this forum that there is no collector value for the primers but maybe the empty boxes? Do these primers have any collector value or do I just use them? The trays are sealed and would have to be cut to open them. I have much older Rem primers that have no collector value... some folks are interested in the packaging, however... you can send that via USPS, unlike the primers... I'd shoot 'em. These came via an estate sale too through my smith...I went in last Tuesday to p/u 1K LRP's and came out with 23.4K LRP's instead. Lucky day. Nice find. Congratulations. Yes do use the primers up. Save the boxes as those may have collector value. Basically a old primer looks like a new primer so one cannot tell old from new. Thus not much value to the primers, but they likely still work just fine.